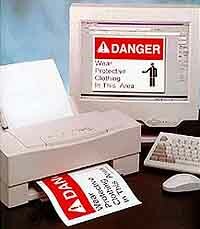 With MaxiSigns99, users can create all of their own OSHA and 1998 ANSI compliant safety and facility signs with a PC and ink jet or laser printer. The software offers instant access to over 2000 pre-formatted OSHA and 1998 ANSI compliant safety signs. To easily find a sign to print, select a sign category with a click-of-the-mouse. Choose from 45 category application areas.Within these 45 categories are individual signs, ready-to-print that pertain to each application area. Any of these pre-formatted signs can automatically translate from English to print in Spanish and bilingual formats. Users can also create custom signs to meet special sign requirements. Select from eight headers/signal words, 330 pictographs and edit the message to generate any sign. Users can even import their own pictographs, such as a company logo. Sign and tag formatting is automatic. K-SUN Corporation, 370 Smc Dr., P.O. Box 309, Somerset, WI 54025-0309. Tel: 715-247-4440; Fax: 715-247-4003.